Data center complexity slows down critical production operations, making it more important than ever to automate IT management and delivery. That includes secondary apps and data. Don’t let different management tools and applications for unstructured data negatively impact your agility. Replace manual processes, SLAs that rarely change, and unproductive workload recovery with a fast, easy, and modern secondary data solution that integrates with your existing applications. Digital businesses rely on automation and APIs to speed IT delivery. Cohesity automation and APIs provide self-service capabilities and error-free consistency that delight users and free IT for more important work. Cohesity alone can simplify secondary data protection or work in concert with other popular cloud management platforms because our API-first architecture exposes functions including backup recovery, test dev, and file and object services. Integrate Cohesity with your existing orchestration tools such as VMware vRealize and ServiceNow or create home-grown custom portals for automation, reporting, and monitoring. Hyperconverged, software-defined Cohesity consolidates secondary data protection silos to deliver data instantly for recovery, make workloads productive for test/dev and analytics, help ensure faster delivery with fewer errors, and support multi-cloud environments in modern data centers. 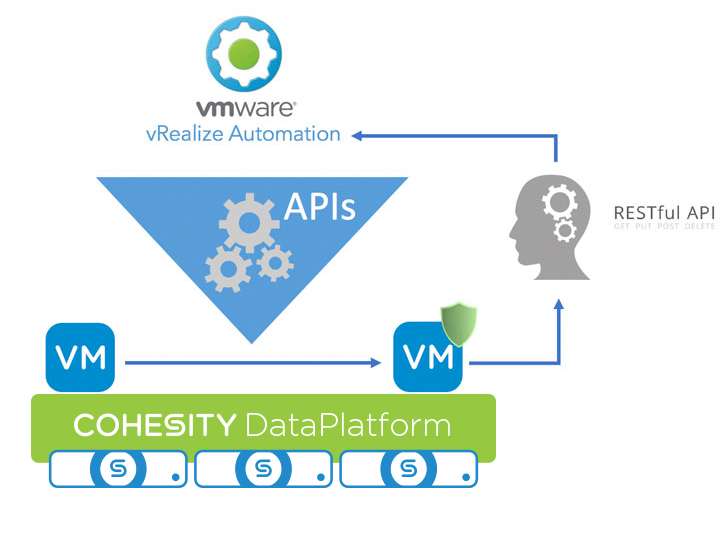 Use your existing automation and orchestration tools such as VMware vRealize Automation and ServiceNow with Cohesity to improve the delivery and ongoing management of modern data center infrastructure. Enjoy full, policy-based automation using the rich set of Cohesity's REST API implementation for secondary data and infrastructure. 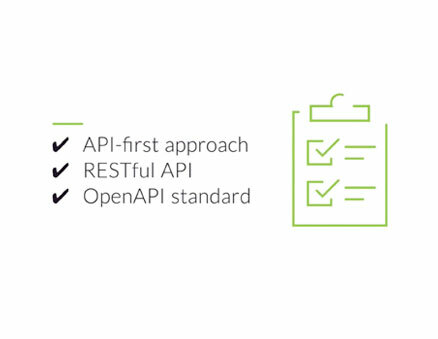 Built on the industry-standard OpenAPI 3.0 specification and shipped with the Swagger UI to learn the API on Cohesity Cluster, enterprises speed development and tap the power of fully backward-compatible REST APIs. Give users faster access to the resources they need. Cohesity’s integration with management platforms simplifies self-service, end-user access to secondary data for ongoing tasks, including changing protection policies, search and restore, and cloning for test/dev use cases. Cost-effectively leverage cloud. Use Cohesity to automate cloud-based data workflows for archival and disaster recovery to gain cloud’s cost and scale economies with the visibility, security, and control you need. Simplify virtual machine (VM) protection with policy-based automation. Using vRealize Blueprints and service catalogs, perform backup as a service, manage complete VM lifecycles, deliver policy-based, end user self-service, automate routine tasks, gain granular file search and recovery, and automate test/dev cloning. Change SLAs easily and gain instant VM recovery. Learn more. 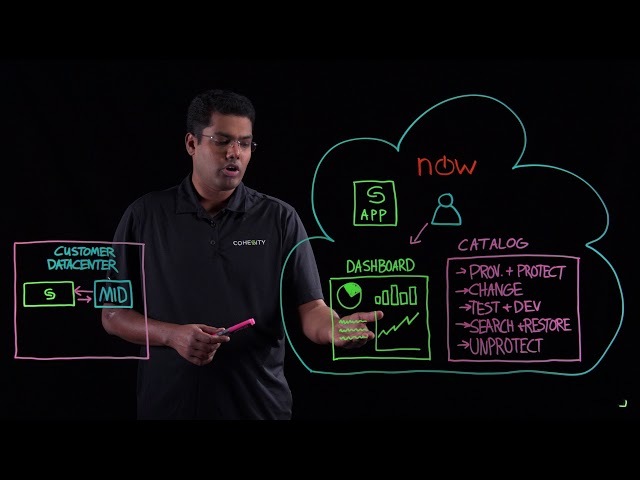 Add Cohesity DataProtect during VM deployment. With Cohesity APIs and VMware vRealize Orchestrator, blueprints are automatically presented with a list of all available Cohesity Protection Jobs. Easily move VMs from one Cohesity protection job to another when you decide or when data protection requirements change during a VM’s lifecycle. 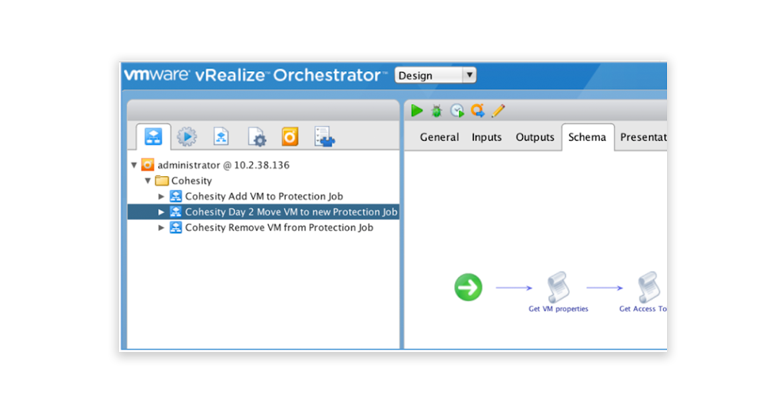 vRealize Orchestrator integration pulls the list of available jobs the VM can be moved to in Cohesity. Destroy VMs when they’re no longer needed. Complete a VM lifecycle by removing the VM from vCenter and also from the Cohesity job. Protect VMs with policy-based automation using ServiceNow for the centralized management of service requests, tickets, and approvals. Manage ServiceNow workflows including VM protection, cloning VMs for test/dev, searching and restoring files and folders, unprotecting or changing SLAs on VMs, and enabling on-demand VM backup. Learn more. Create tickets for each action and all service requests, assigning approvals and rejections. Ensure VM lifecycle management while allowing end users to initiate and manage their own requests. Deliver flexibility with control. When a VM moves from one protection job to another, Cohesity opens a change request that goes through an approval process. On-demand, user-managed changes include frequency of backup, entering unprotect mode, or changing the SLA. Provide a dashboard with self-service catalog items for self-provisioning, creating test/dev clones of a VM, and seeing resource utilization. Users can initiate on-demand backup, create a test/ dev clone from a backup, or restore lost data from any point in time. Reduce incident overhead. IT operations management allows for self-service, so end users can manage their own configurations and incidents, reducing administrative overhead to free up IT for innovation. Cohesity’s intelligent data platform simplifies our VM backups and replication. By consolidating our entire backup environment into a single system, we now have one simple and powerful, policy-driven interface to manage end-to-end data protection for our extensive virtual infrastructure. Furthermore, with Cohesity CloudArchive we can now easily and safely leverage public cloud services for the long-term retention of our critical corporate data. Looking to Automate the Backup, Recovery, and Replication of Your Secondary Data?